Strategic-reports.com helps you model and then optimize scientific and/or behavioral processes for engineering, manufacturing, Internet applications and more. Whether it's engineering design best practices, development best practices, management best practices, Web best practices, technology best practices, network best practices, software best practices or simply best practices research, we can help you research, define and write your Best Practices Guide. What is a Best Practice? Wikipedia defines a "Best Practice" to be a "technique, process, activity, incentive or reward that is more effective at delivering a particular outcome than any other technique, method, or process." Best Practices Involve Standards - Regardless of whether your field is business process management, medicine, manufacturing or management, our Best Practices Guides can be used to define THE standard way of doing something within constraints imposed by the organization defining the best practice. The International Organization for Standardization or ISO is probably the most well-known standards-setting organization. ISO is composed of representatives from various national standards organizations and has set the ISO standards ISO 9000, ISO 9001 and ISO 9004 standards that define the vocabulary, requirements and processes for product and process quality management systems. Six sigma is another set of standards that is designed to remove defects in manufacturing and business processes. 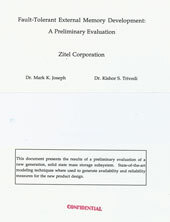 Markov Modeling Service - Our Markov Service provides you with expert consultants in Markov Chain Modeling so that you can develop Markov models and techniques to capture modeling data, for your systems modeling, application modeling, simulation modeling needs or engineering design needs. We recommend applying Markov chain mathematics to real world problems, and can help you develop optimization algorithms, optimization models that will add invaluable credibility to your Best Practices Guide or engineering specification. The New Product Proposal to your left used the SHARPE model to design a fault tolerant memory system. This in turn resulted in design team innovations and three US Patent Office patents. Markov Chain Example – Markov modeling can be applied to almost anything from nursing best practices to security best practices, to Tsunami preparedness best practices. Take for example the case of Santa Cruz California which would be about 50% underwater with great loss of life if a "once in 10,000 year" killer Tsunami were to strike Monterrey Bay. Using Markov chain techniques and mathematics it is possible [as it would be with any ocean-front city] to model the "evacuation bottlenecks" in getting people away from the [potentially] underwater parts of town immediately after the first "trigger alert" from the NOAA Pacific Tsunami Warning Center. Such a model would provide a very practical solution, and prevent loss of life by immediately notifying parking and wharf toll collectors to open their exit gates, and [simultaneously alert the CHP to "reverse traffic" [lanes coming into town to exit lanes] on Highway 17 out of town. The system would also alert local Santa Cruz police to go to pre-assigned local intersections [between the evacuation-bottleneck toll collectors and the way out of town], disable traffic lights and speed the flow of traffic away from the potentially underwater areas - thereby preventing the loss of life.